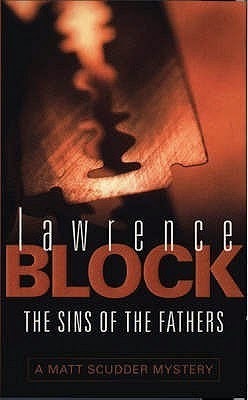 The Sins of the Fathers would be a solid four stars from me on any day. I'm giving it five because it's the first book in what I've always believed to be the best P.I. series that anyone's ever done, if not the best crime fiction series that anyone's ever done. The Matthew Scudder saga now runs to seventeen books and a large number of short stories, and it's hard to think of any other writer who has done a series consisting of this many books over this many years while maintaining this standard of excellence. And for as many times as I've read this book by now, and for as well as I know the story, it's always a treat to pick it up and read it all over again. In particular, the first chapter is excellent. In a lean, crisp thirteen pages, Block not only sets up the mystery to be resolved but provides a brilliant introduction to the character of Matthew Scudder. Although the character will continue to grow and develop over the course of the series, the first chapter essentially tells you everything you would ever need to know about the man. Scudder is an ex-cop who left the force for very personal reasons. He now works as an unlicensed P.I. Clients don't hire him in any traditional sense, but occasionally he does a favor for someone and they show their appreciation by giving him monetary gifts. In this case, the someone is a businessman from upstate New York named Cale Hanniford. A few days earlier, Hanniford's daughter, Wendy, had been savagely murdered in the apartment she shared with a young man named Richard Vanderpoel. Minutes after the killing, Vanderpoel was found covered in the victim's blood, exposing himself and shouting obscenities in the street in front of the apartment. The police arrested him and less than forty-eight hours later, the young man hanged himself in his cell. The police have closed the case and Hanniford accepts their obvious conclusion that Vanderpoel killed his daughter. But he wants to know why. Hanniford and Wendy had been estranged for several years and he knows nothing of her life during that period. He now knows that she was living in an expensive apartment with no visible means of support, which suggests the obvious to everyone involved. Still, no matter how sordid the details, Hanniford wants Matt to dig into Wendy's life so that he will know how she came to such a tragic end. Scudder accepts the job and begins investigating in his usual methodical way, turning up one thing after another, asking one question after another, and in the process learning things about both Wendy and Vanderpoel that no parent might ever want to know. The story is spare and lean--there's not a wasted word, and it draws you inexorably into the lives of all the characters, but especially into that of Matthew Scudder. It's a haunting and intoxicating introduction that sets the stage for all of the great books and stories to follow.